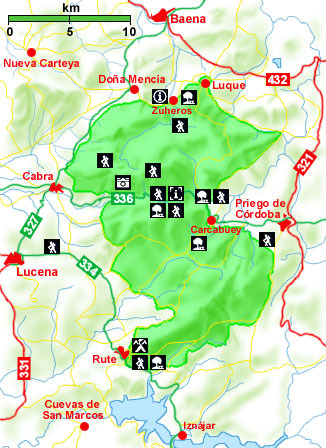 The Natural Park of the Subbéticas Mountain ranges is in the south of the province of Cordoba, in the Mountain ranges which give it their name. It has an area of 31,568 hectares; eight beautiful towns lie within it and there is a population of about 64,500 inhabitants. The beauty of the area, together with the cultural history of the towns, make this natural park a special nucleus within Andalucía. The Park contains the Bética Mountain range, with some notable limestone features. The geological structure and its associated formation have given rise to numerous caves, like the Cave of the Bats which, with its archaeological finds, dates the first settlers as far back as the Neolithic period. Since then, various establishments of different cultures have left their tracks in this Mountain range. The typical Mediterranean vegetation, which covers most of the Park, is replaced by rupícola vegetation in the rocky areas; some of the species present are unique to these mountain ranges.